Our after-school Student Enrichment Program (SEP) is a year-round, licensed program that offers care for our St. Mary’s students after school and during the summer months. 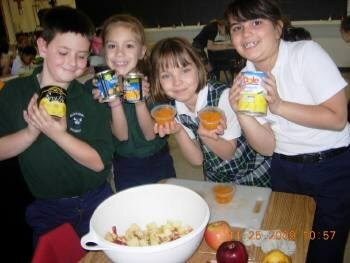 Having begun in 1999, this program has since proved to be a very valuable and highly affordable resource for working families and provides a safe, nurturing environment that is a natural extension of our school community. To register, go to our Tuition Agreement form. The SEP program is open each school day from 3:10 pm to 6:00pm. 0ur Summer Care program is available June, July and August from 7:30 am to 6:05 pm. The program is closed the following holidays or holy days: Labor Day; Thanksgiving Break; Christmas Break; Martin Luther King Jr. Day; President’s Day; Good Friday; Easter Monday and Memorial Day. The week prior to school opening the program is closed in order to prepare and clean the Kindergarten room for instruction. The week after school closes at the end of the school year, the program is closed to prepare and clean the room for the day care program. Emergency Days, such as snow days, or power outages etc…, when the school is closed, the SEP program will be closed. The St, Mary’s School PTO- Activities Program (ASAP), once again hopes to provide a variety of opportunities for your child to grow socially and academically in a very fun, creative, and exciting, non-traditional, Christian environment. The ASAP provides many levels of interest, excitement, and growth for those students, who choose to register and participate in the A/P. We are very fortunate to again have professionals from Catholic & public schools, and parents from St. Mary’s school that donate their time, talent, and/or skills, as class instructors and who are deeply committed to the success of the SM PTO-After School Activities Program. We have a variety of classes to try, some new some old favorites. We hope we will have the opportunity to teach and encourage your child to discover, enjoy, renew and/or further develop his/her talents, interests, and curiosities through their enrollment in an A/P class(s). More info - Read this first!